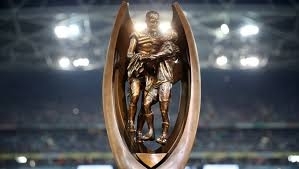 The near sell-out 83,500 capacity ANZ Stadium in Sydney was the focus as the top two teams it the NRL competition, minor premiers Sydney Rooster took on the runners-up, Melbourne Storm, in the 2018 Grand Final. The first time that these two sides had met in a Grand Final. The two sides met just once during the reguar season, the Storm winning by 9-8 in late June thanks to a Cameron Smith drop goal with two minutes remaining, but the Roosters were boosted by the inclusion on Cooper Cronk who had been a major doubt. The Roosters were slight favourites with the bookies, but there was very little in it, the stage was set for a sensational finale to the Australian season. Interference at the play the ball by the Storm gifted the Roosters the opening points courtesy of the boot of Latrell Mitchell, after just three minutes in a cauldron like atmosphere. On seven minutes Daniel Tupou was on hand wide left to take a miss-out pass from Luke Keary to go over on the overlap and dive to score just before running out of land. Mitchell pulled his conversion attempt wide of the left upright. It was a terrific opening for the Roosters and on fourteen Mitchell stepped inside and leapt for the line off a Tedesco pass with referee Klein having no hesitation in pointing to the spot. The centre added a goal to his conversion for a 12-0 lead. The Storm seemed to have no answers. Jake Friend picked up a Cooper Cronk knocked-on ball and broke for forty metres before being tackled to ground, Cameron Munster held on too long in the tackle and was sin-binned for his effort. Mitchell kicked the resulting penalty from thirty metres out for a 14-0 lead. Four minutes from the break Joseph Manu took the ball five metres out and with a two man overlap he leapt through the air to ground on the line. Mitchell pulled his kick just wide of the uprights but staring down an 18-0 half time deficit, the Storm were being totally dominated. The Roosters started the second half as they had ended the first, in relentless fashion, but unlike the first half the Storm maintained the integrity of their line. Just after the hour mark Joshua Addo-Carr intercepted a wayward Manu pass and went seventy metres to score, somewhat against the run of play. Storm skipper, Cameron Smith, added the extras for 6-18, a glimmer of hope for the Melbourne side. A Suliasi Vunivalu knock-on from a high kick on sixty-eight gave the Roosters six in the Storm twenty and on the last tackle Keary slotted over a drop-goal from thirty metres. Referee Klein sent the decision to the bunker who agree with the on-field awarding of the point. When Cameron Munster appeared to kick a Roosters player in the head while he was on the floor saw the incident on report and Munster going into the sin-bin for the second time in the game, his night was over. Mitchell kicked the penalty goal for 21-6 as the clock ran down to the final hooter. This was the Roosters third Grand Final win, their first since 2013 and in some fashion as they demolished the Storm in what had been billed to be a close game in the pre-kick off punditry. There were many stand out performances, notably Luke Keary, Latrell Mitchell and on-field general Cooper Cronk. It was a complete performance from the Roosters, with Storm never able to get any time on the ball or get into their stride. The perfect game plan, executed to perfection. The Minor Premiers became Grand Final winners. <B>Roosters:</B> Tedesco, Tupou (T), Mitchell (T, 3G), Manu (T), Ferguson, Keary (DG), Cronk, Waerea-Hargreaves, Friend, Taikeiaho, Dordner, Abusson, Radley. <B>Subs:</B> Liu, Napa, Tetevano, Matterson. <B>Storm:</B> Slater, Vunivalu, Chambers, Scott, Addo-Carr (T), Munster (SB on 30 & 77), Croft, Bromwich J, Smith (G), Glasby, Kaufusi, Stimson, Finucane. <B>Subs:</B> Bromwich K, Welch, Smith, Solomona. <B>Referees:</B> Gerrard Sutton and Ashley Klein.